This article must be prefaced with a BIG disclaimer: I am not trained in veterinary medicine and have no skills in this area. I rely on my own veterinarian, who knows my cats, to use his training and expertise in diagnosing my cats' ills, when indicated. I write only from the viewpoint of one who has shared my home with dozens of cats over an equal number of years. I have had cats with distemper, cats with cancer, cats with FLUTD, cats with dental disease and on numerous occasions, cats with abscesses and/or other injuries. Throw in an assortment of undiagnosed (but not un-treated) ills, and I've had my share of trips to the veterinarian. And I learned at a very early age how urgent those trips can sometimes be. I often get e-mails from folks describing various symptoms their cats are displaying and asking if I have any idea of the causes. Although I may often have ideas or opinions, my answer is always the same: "Even if I were a veterinarian, I would not attempt to diagnose your pet without a thorough personal examination. Your kitty needs to be seen by a veterinarian, without delay." Here are three simple rules I have devised. The First Rule is "Know Your Cat"
Does he wolf his food in one sitting, or does he "graze" all day? A sudden lack of appetite should be cause for concern, particularly when combined with other symptoms. Become familiar with the size, color, consistency, and odor of your cat's feces. Note the color and amount of his normal urine output, and how often he urinates normally. Diarrhea, constipation, or straining to urinate are all red flags that your cat needs to bee seen by your veterinarian. A cat normally walks with a purposeful stride, in measured paces. Changes in a cat's walking style can signify an injury or arthritis, and a veterinarian can help. Is your cat always ready for play? Is he normally energetic, e.g., running instead of walking from one place to another. Cats normally become less active as they age, but even a senior cat should play when presented with an interactive toy. 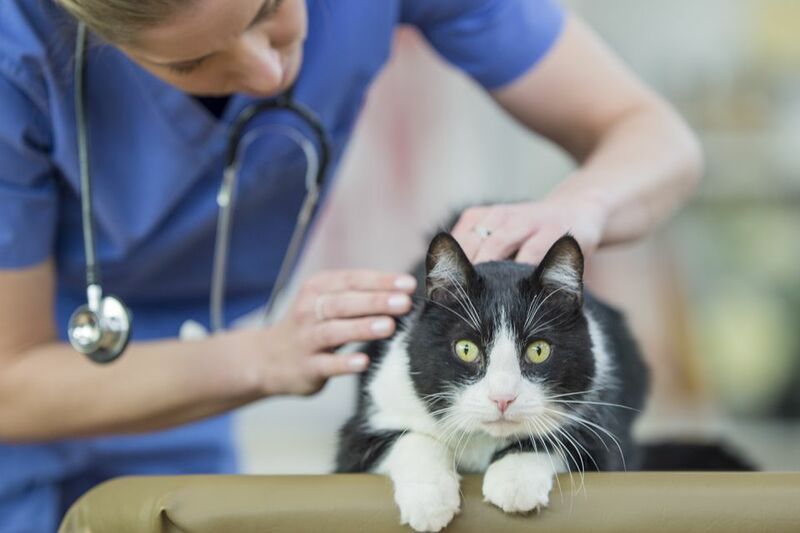 Sudden changes in your cat's activity level can signal an injury, lethargy, or depression, all of which are symptoms that should take you to the vet. Cats are normally fastidious creatures, and will spend a large part of their waking hours grooming themselves. Failure to groom regularly, resulting in a greasy, matted, unkempt coat, can be caused by arthritis or depression, among other causes, and is a signal the cat needs help. On the other side of the coin, a cat that suddenly starts grooming one particular area excessively, may suffer a skin irritation, caused by fleas, mites, or the grooming itself, and should be seen by a veterinarian. Although cats have a reputation for independence, most cats are very sociable with the other occupants of their home, both human and four-legged. A previously social cat who suddenly starts huddling in a corner has problems, either physical or emotional, and needs professional help. The classic example is a cat that suddenly starts urinating outside the litter box. Provided the box is clean, and there are no recent environmental changes (new cat, new baby, change of residence), inappropriate urination is often a symptom of a lower urinary tract blockage or infection, both very serious conditions. He should be seen by a professional, without delay. The Second Rule is "When in Doubt, Call the Vet"
If your cat shows any one of the previously listed symptoms for more than 12 hours, or more than one of them for any length of time, I'd advise calling the veterinarian without delay. Obviously, emergencies are just that, and waiting any length of time could put your cat at risk. Emergencies include injuries from accidents, burns, possible poisoning, insect stings or bites, seizures, or swallowing foreign objects, among others. These conditions all indicate a call to your vet during office hours, or a call to the the nearest emergency veterinary clinic after-hours. Other borderline conditions, such as sudden and ongoing projectile vomiting or extreme lethargy also merit an immediate phone call. Our senior cat, Bubba, throws up fairly frequently, usually soon after eating. We've learned not to be too alarmed about it, because we've had him checked out by our veterinarian several times. Some cats just eat too fast and if they have a particularly sensitive stomach, they'll hurl as a result. Still, we always watch him closely after these incidents, and if he ever showed any other signs of sickness (lethargy, weakness, continued vomiting, or the significant "3rd eyelid"), we'd get him to the veterinarian immediately. We've had cause to do so on a couple of occasions. The Third Rule is "Know When to Search the Web"
The Internet offers a wondrous variety of information for those seeking it, and the wealth of veterinary articles about various diseases and conditions is a good example. I'm as quick as the next person to point the mouse to seek out more information about a particular condition, as I've done with Bubba on more than one occasion. But I did so, only after our veterinarian had examined Bubba and started a course of treatment. I'm sure our vet thought I was a pest, because I'd read an article and call him, saying, "What about this or that potential diagnosis?" He was understanding though, and put Bubba through every test I suggested, just to ease my mind. He also listened when I suggested some alternative treatment I'd read about. If he thought a holistic remedy might help, but more importantly, would do no harm, he'd give it a try. Otherwise, he would explain why it might not be appropriate. The bottom line is that if you cat exhibits any unusual symptoms or a combination of symptoms, pick up the phone first, and after your veterinarian has examined kitty and prescribed a course of treatment, then pick up the mouse and surf to your heart's content, for a better understanding of your cat's condition. Could Your Cat's Health Be in Danger From Urinary Tract Crystals?